BOXING LEDGER | LATEST BOXING BLOGS | BOXING ARTICLES | BOXING BLOG FIGHT: HBO PPV 11-14-09 Pacquiao TKO's Cotto in 12 Rounds, Sets Up Possible Date with Mayweather Next? HBO PPV 11-14-09 Pacquiao TKO's Cotto in 12 Rounds, Sets Up Possible Date with Mayweather Next? If anyone did not consider Manny Pacquiao an all-time great before his bout with Miguel Cotto, they must consider him one now. Manny Pacquiao scored another impressive victory as he stopped hard hitting welterweight Miguel Cotto in the 12th round to win the WBO Welterweight Title. Pacquiao has now claimed a record 7th world title. Hang a punching bag without drilling with a heavy bag stand. The victory for Pacquiao did not come easy as Cotto landed some hard punches, but Pacquiao's relentless attack could not be stopped. In the 1st round, Cotto used his jab to push Pacquiao back. Cotto landed the cleaner shots as Pacquiao did not connect with any meaningful punches....yet. Pacquiao came on late in the 2nd round and landed a sharp left uppercut. Pacquiao moved in and out much better this round. Pacquiao scored a knockdown when he landed a flash right hook causing Cotto's right glove to touch the canvas. Cotto came back strong, but Pacquiao landed the sharper and cleaner punches in the round. In the 4th round, Pacquaio dropped Cotto with a straight left that Cotto appeared to never see coming at him. 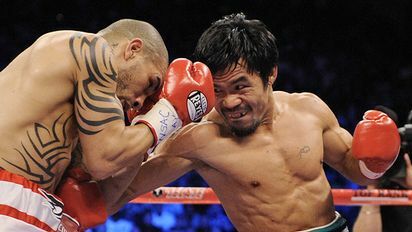 Cotto came back to land some body shots with Pacquiao on the ropes, but Pacquiao was starting to inflict a lot of damage. However, Cotto landed the harder punches in round 5. A left hook stunned Pacquiao with 30 seconds to go in the round. Pacquiao answered in the 6th round by landing crisp punches to Cotto's face. Cotto could not counter as Pacquiao was not in range to be hit. Pacquiao continued to beat Cotto to the punch in rounds 7 and 8. Pacquiao blistered Cotto with punches, forcing him to retreat and try to box using the jab. It did not matter as Pacquiao was continually getting his punches off first. Pacquiao continued to press forward and was able to take Cotto's punches better in the later rounds. Cotto was continuing with his best effort, but Manny's attack proved to be too strong. Cotto stepped up his punch output in the 10th round, but Manny went on the attack again in the 11th round. Finally, referee Kenny Bayless had seen enough as he stopped the fight in the 12th round when Manny landed another solid straight left hand. What's next for the Filipino sensation? Hopefully, for all fight fans, a bout can be made against Floyd Mayweather Jr. It would be one of the biggest fights of all-time and would bring more popularity back to the sport. This is truly a match up of the 2 best fighters, pound-for-pound in the world. Mayweather's pure boxing ability against the relentless, whirlwind attack of the "Pac-Man". You could not ask for more if your a boxing fan. Who would odds makers open as the favorite in this showdown? It will be an extremely tough negotiation, but one can bet on this, there is too much money to be made for this fight not to happen in the very near future! Great heavy bags by Ringside and Everlast.